Walk south to Houston St. I believe New Yorkers are kind people. My mom is a New Yorker, born and raised. 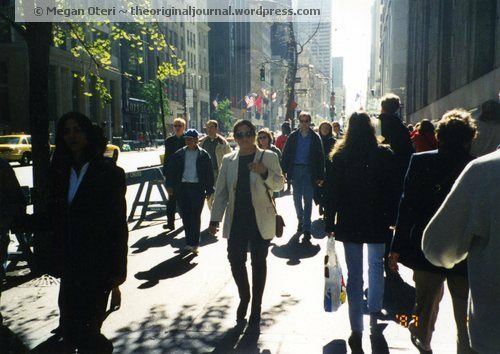 She always said, “You ask any New Yorker for directions and they will stop and give them to you.” I tested her statement when I was in New York for the first time in 1998. My last stop on my three-day adventure had to be The Village. I asked for directions in a camera store after visiting my mom’s childhood stomping grounds. It was a beautiful fall day. 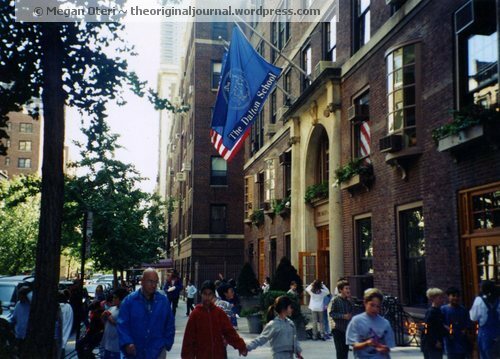 I went to her school, Dalton and where she grew up — Park Avenue and 89th. Dalton School. It should be noted that this photo is from 1998 and was my first camera, which I borrowed from the friend I was staying with. I love film — it makes you choose your photos carefully. I stopped in to get film at a camera store near Lexington and 86th (at least that is what I the journal says). I think this camera store is a Best Buy now. Three very friendly and helpful New Yorkers gave me directions to the Village. This was pre-cell phone and Google map days. I don’t even think digital film was invented yet. 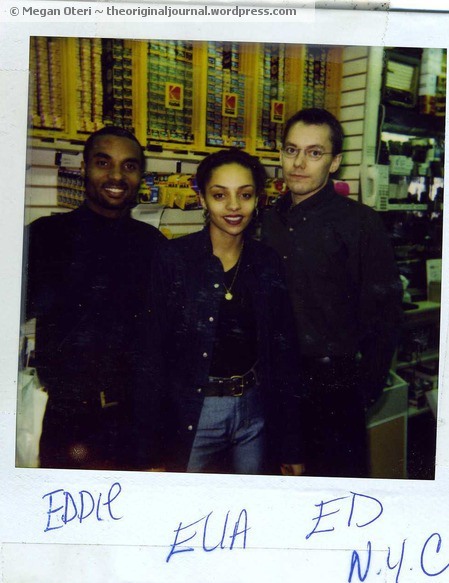 Ed even wrote the directions down for me in the NYC Journal; Ella, Eddie, and Ed wrote their own journal signings too. When I got off the 6 Train, I asked a man for directions to the White Horse Tavern. He was on his way to pick up his daughter at day-care and kindly said he did not have time to sign the journal, but he gave me directions verbally. I had just walked up the subway stairs and it was literally just around the corner. He pointed and smiled. I wanted to go to the White Horse Tavern because I was going to be discovered. I was wearing a scarlet begonia in my hair (I know — how cliché). 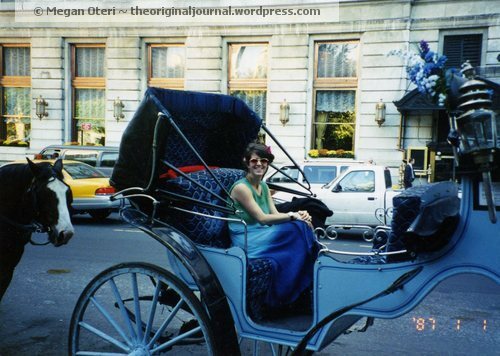 I didn’t take a carriage ride, as it was too expensive. I just hung out with the horses for awhile. As I walked through the empty bar, I was disappointed not to see a room full of editors and writers. I did walk past an older man sitting by himself at a table near the window. My scarlet begonia fell to the floor. I was not aware it fell and went to the bar to order a beer. The older gentleman said, “Excuse me miss, your flower fell on the floor.” I picked it up and asked the man if I could join him. I was not discovered, but I met a very interesting man who fought in the Korean War (Inchon) and was a Marine like my father. He didn’t sign the journal, but he told me what to write. I wrote his name and 3rd BN H-Co. 1st Marines and his Marine ID number. When I shared with him that my father was in Inchon, he didn’t say much, he just acknowledged how brave my dad was for being there — for surviving. I wrote a longer essay about my adventure in New York that October (which was my first time visiting New York). Long story short: I didn’t have enough money to take a cab back to the flat I was staying at. I had to go get my bags and my friend I was staying with arranged for a car to take me to the airport. I really didn’t want to leave the White Horse or New York for that matter. The bar was slowly filling up with energy and people were coming in after work. 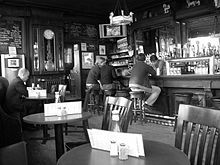 I thought of all the great writers, ideas and conversations the tavern had seen and heard. But it was time for me to go. Bill and I sat at second table to the left. I only had subway tokens and enough cash to buy another beer. I didn’t have time to take the subway; I needed to take a taxi. I was prepared to miss my plane on purpose. I went to the pay phone to call my friend, but he did not answer. I went back to the table and told Bill my predicament He said I had responsibilities I needed to attend to and reminded me that NYC would still be here for plenty more visits. Bill gave me a twenty-dollar bill on one stipulation — I had to pay it forward one day. I did, but that is another story. I stepped out the tavern doors into the late afternoon light after saying goodbye to Bill. Gorgeous shadows cast themselves on the sidewalk — the very same sidewalk Dylan Thomas stumbled on. The same sidewalk Bob Dylan, Jim Morrison, Norman Mailer, James Baldwin, Jack Kerouac and Hunter S. Thompson walked on. I left in a taxi filled with story and wonder. 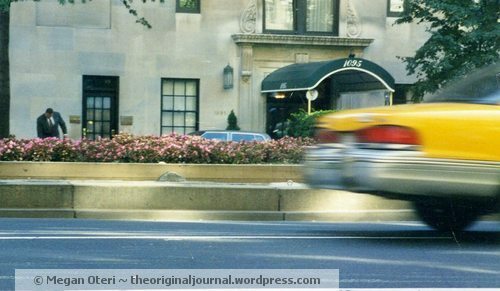 After I got my bags at my friend’s brownstone, the car was there to take me to the airport — the driver in his black suit and hat, waiting on the sidewalk. The sun was setting on New York as the black shiny car entered the tunnel to go to Newark Airport. 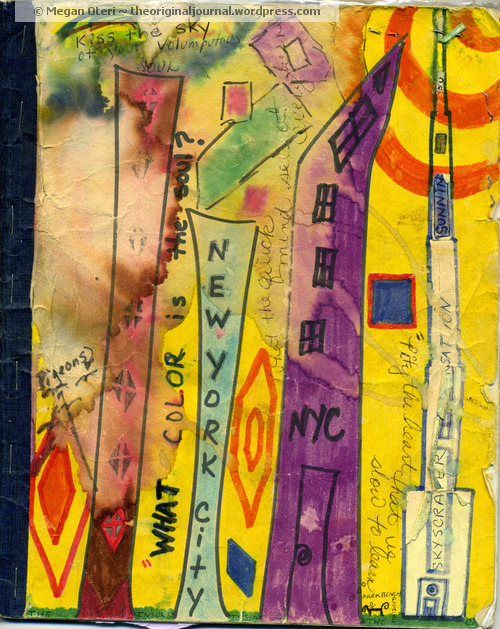 It was beautiful; purple, orange, and red streaks echoed in the New York skyline. I will never forget that beautiful afternoon I ended up in Greenwich Village and I never will forget the kindness of that stranger. Full Journal Page in NYC Journal. The three people in the photo are from a camera store in NYC I stopped in to get film. I asked for directions to the Village at this store. Ed was the person who wrote down the directions. Find The Original Journal on Facebook and Twitter.